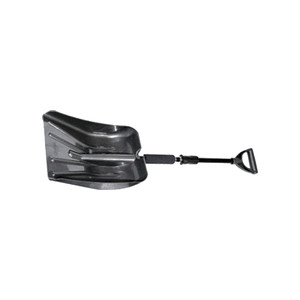 This Ames® True Temper® Mountain Mover® Poly Snow shovel has an 18" Poly Head that is situated on an ergonomic handle designed to reduce back strain and hand fatigue. The Steel wear strip extends the blade life. It also has a Wide, Ribbed Poly "D" Grip for added comfort even while wearing gloves. This Specific Shovel is Currently Only Stocked at the Owego Store. This 18" Aluminum Head Snow Shovel does not have a wear strip. It is situated on a Wooden Handle that is 51" Long. The Handle also has a Poly "D" Grip that makes shoveling easy even while wearing gloves. 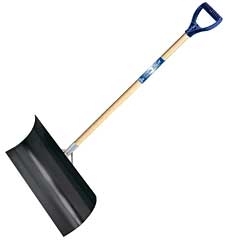 This can be used for both shoveling and chipping packed snow. 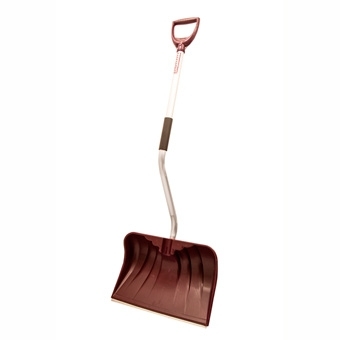 This Rugg® Pathmaster® snow shovel has a Poly Combo Blade that is non-abrasive and safe for all surfaces. It has a straight, vinyl coated steel handle with a molded "D" Grip. 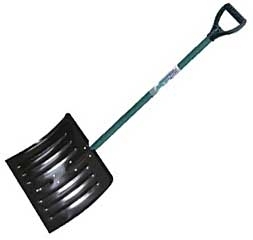 This Rugg® Backsaver® Snow Shovel has a NEW Blade style for Rugg. The Galvanized, steel wearstrip is molded into the edge of the blade for extra durability and strength. There are no rivets to loosen up or wear off. The Blade is 19 ¾" x 13 ½" x 5" Deep. It also features Rugg's® trademark Back-Saver aluminum handle is ergonomically designed to lift the load efficently without adding the extra weight of a steel handle. It also has a foam grip surface for added comfort while using. Also includes a 10 year limited warranty through Rugg. 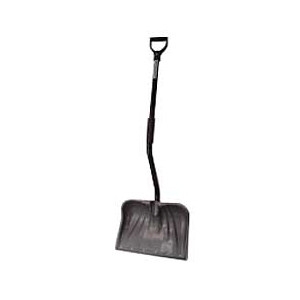 This Vulcan® "Backsaver" Snow Shovel has an 18" Poly Head that also features a metal wear strip. It has a steel ergonomic handle with a sleeve. It also has a poly, cushioned "D" Grip that makes shoveling easy even while wearing gloves. It's lightweight and ideal for both shoveling and pushing snow. The poly blade will not scratch your deck, patio or other surfaces. Made with high-density poly to withstand cold temperatures. Durable resin-coated steel handle. Wide poly D-grip is comfortable for gloved hands. This Garant® Mountain Mover® Poly Blade Snow Shovel features a dark orange poly blade. It has extra support ribs on the back of the blade to provide added strength and stiffness. It also features a stained ash handle with a "D" Grip that makes shoveling easy even while wearing gloves. 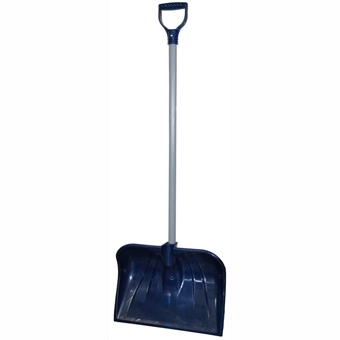 This Rugg® Snow Shovel features an 18" Standard Poly Blade and is situated on a Straight, Vinyl Coated Steel Handle. It Also features a Molded "D" Grip that makes shoveling easy even with gloves! The non-abrasive poly head is safe for all surfaces. Made in the USA. 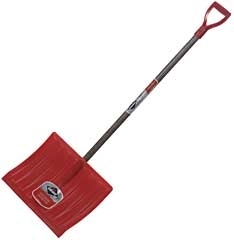 This Garant® Nordic® Wide Blade Poly Snow Shovel features a 17.75"x13.25" Poly Head. It is situated on a Strong, Moisture Resistant Stained Ash Handle with a Ribbed "D" Grip that makes for easy use even while wearing gloves! 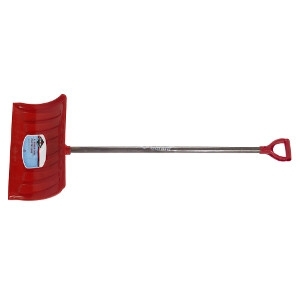 This Ames® Arctic Blast® Snow Shovel features a 14 ½"x 18" Steel Head situated on a Wooden Handle. It also has a "D" Grip that makes shoveling easy even with gloves! Poly combo blade combines the best features of a regular snow shovel with pusher blade convenience. It consists of a 48 inch vinyl covered steel handle with D grip. This Ames® True Temper® Aluminum Snow Pusher is designed for heavy-duty use. It's Deep Handle Socket is designed to provide added strength and durability. It has a steel wear strip and a steel braced socket that provides extra strength. The Blade itself is 11"x24" and the Handle is 52" Long. The wide "D" Grip Handle Accomodates even the thickest of gloves! 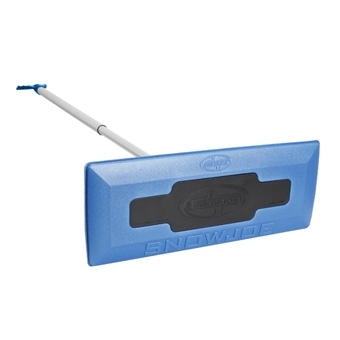 This extra wide, Penguin® Snow Pusher is ideal for cleaning large areas of snow cover. The one-of-a-kind VersaGrip™ is ideal for accomodating gloved hands in different positions. It's wide, circular design makes it easy to grasp without causing hand fatigue or discomfort. The Handle is constructed of durable steel and the head is constructed from high-density poly to withstand cold temperatures. It does not have a wear strip which will not scratch surfaces. This Specific Snow Broom is Currently Only Stocked at the Endicott Store. Treat yourself to the all-purpose snow pusher to push light snow away from large areas. An ideal product for clearing snow from your asphalt or paving stone driveway. For occasional use. This snow pusher is designed for those who want a product with an excellent quality/price ratio. It features a "D" Grip for easy use even with gloves and also has a stained ash handle. Great for Snowboarders, Hikers, Snowshoers’ and more! They are collapsible and fit GREAT in a knapsack. Available in black or blue. 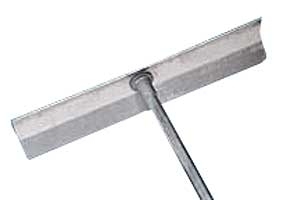 This Yukon® Roof Rake has a 24"Wx6"L Poly Head that is situated on a 16 ¼” Foot Long Handle. These are Excellent to remove Heavy Snow Build up from your roof to prevent damage. 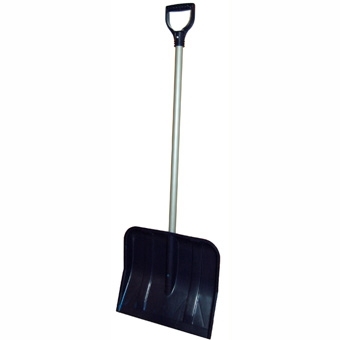 This Rugg® Snow Shovel is the "Original" Back-Saver Design. It has an 18" Poly Combo Blade and a riveted Steel Wear Strip and has a Foam Grip Handle for added comfort while working. 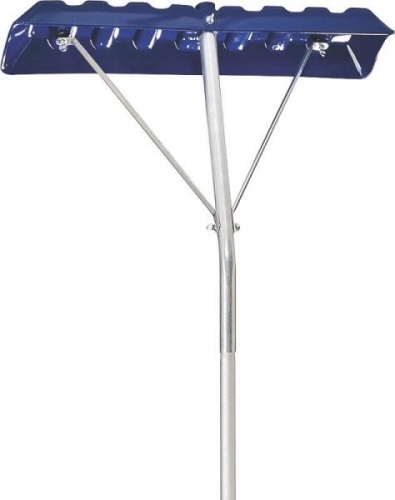 This Nordic® Poly Blade Snow Pusher snow shovel does not have a wear strip. It is situated on a strong 1 ¼” moisture resistant stained ash handle with a wide ribbed poly "D" Handle. 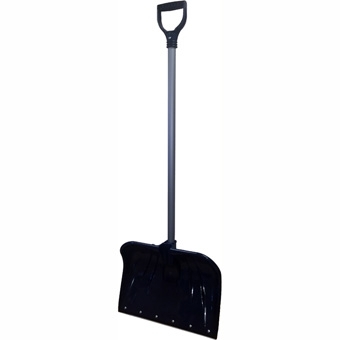 This Rugg® Avalanche Pro Lite Snow Shovel has a 20" Poly Snow Shovel with an Aluminum Handle and a large blade. The Poly-Combo blade also has a no break additive and a 10 year warranty.